A variety of SAFE Stainless Steel toys for your feathered gem. Love this! Stainless Steel Twister is an awesome base for toys for small to medium birds. Measures 10 1/2" long (twisted) and 3" wide. SS is 1" wide. Drilled with six holes. Let your imagination run wild! Hang with a SS Swivel Hook for even more enjoyment! Below is a sample of what you can do with this twist. Awesome!Stainless Steel Twister is an awesome base for toys for medium to large birds. Measures 16 1/2" long (twisted) and 4" wide. SS is 1 1/2" wide. Drilled with eight holes. Let your imagination run wild! Best Buy! Stainless Steel Twister is an awesome base for toys for medium to large birds. Measures 16 1/2" long (twisted) and 4" wide. SS is 1 1/2" wide. Drilled with eight holes. Let your imagination run wild! You receive three. Comes filled with shreddables but can easily be replaced with your bird's favorite veggies. A great foraging toy! 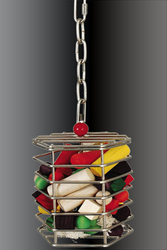 Perfect for Parrotlets, Lovebirds, Budgies and other small birds and it's STAINLESS STEEL! 7.25" in length (including chain) x 3" wide. Cage is approximately 4" high.